I was surprised that this game lost out to Quik and Silva in the readers game of the month vote. For those of you who have already read my top ten game list you will know that I rate this game very highly indeed. For those of you who do not know the game the simplest way to describe is an up date of Solomon's Key. The idea is to use your ability to create a destroy blocks to help your fellow wizzard escape to the level exit by providing a safe route. It sounds easy but you have to plan your route carefully otherwise you can end up leaving your wizzard stranded. Why is this game great. It just does everything faultlessly. The graphics are simple yet perfectly executed. 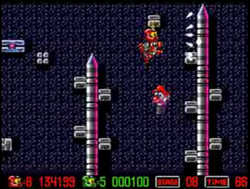 The game levels are challenging and increase in difficulty at the right pace. There is a password system to let you return to the game without having to revisit levels already mastered. Similar to Quik and Silva this game has aged well. The enjoyment I had playing this on my original Amiga 500 back in the 1990's was easily matched playing on my new A1200 in 2010. An all time Public Domain Classic and worth downloading right away. No other score than a top five starts would be acceptable for this. It's December - We have already had snow in the UK and some of us may have been snowed in and unable to get to work as trains and busses were cancelled and roads closed. Rather than feeling annoyed about this dust off your old Amiga 500 and boot up some festive fun. 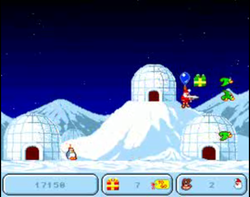 How to describe the game - It seems like Jetpack but playing as Santa - You fly around the screen shooting enemies whilst collecting a certain number of presents. Once you have collected the required number of presents you move onto the next level. There is fesitve music and cartoonish sound effects. The levels are short and fast paced which keep your attention. The graphics are fun, the music is jolly, the game moves quickly from one level to the next which helps keep things fresh. Surely no one can play this without breaking into a smile. Must be getting into the Christmas spirit already, another top score. This game was voted Game of the month for December in our poll last month. It is a game I have fond memories of as a teenager when I first started collecting PD games. At the time it really stood out as a high quality game and could have passed as a budget title with its cute graphics and simple game play. Loading up the game after a gap of about 15 years I wondered if the game would still hold its charm and thankfully I wasn't disappointed. The game play is still solid and it is fun blasting the cute enemies away. The game pays tribute to different games of the period, the background is based on the Mario games of the early nineties, there are “guest” appearances by Sonic, the Bubble Bobble characters and is that Mario's head on a spring I can see in the screenshot. The game keeps everything simple so don’t expect anything challenging to this genre. However if you just want a game to idle away a few minutes this is definitely worth a look.